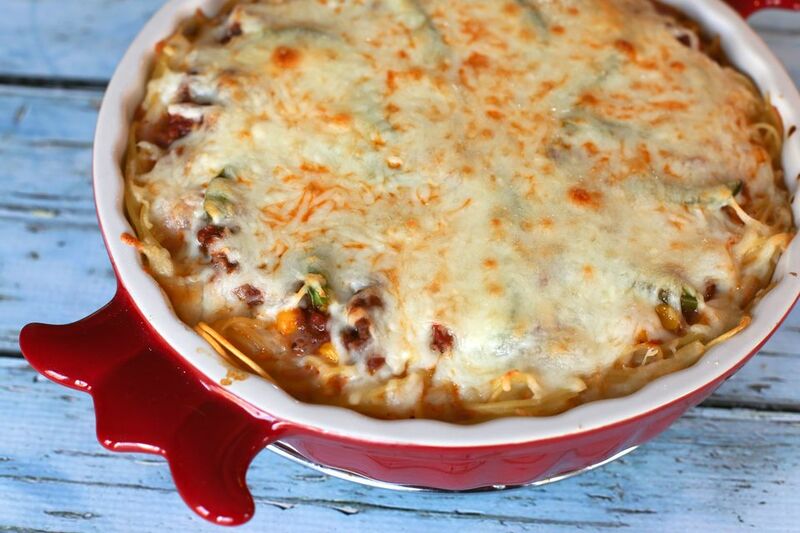 This spaghetti pie is a sure family pleaser. The beefy spaghetti is a complete meal baked in a deep-dish pie plate or casserole. Serve the dish with a Caesar salad and crusty bread. Use a jar of spaghetti sauce in this recipe or your favorite homemade sauce. To vary the flavor a bit, use part Italian sausage in the filling. The corn is a tasty addition, but feel free to leave it out if you'd like. Or add some sliced ripe olives. If you want to include more vegetables, cook 1/2 cup of finely chopped celery and a shredded carrot in the skillet with the ground beef. Grease a 9-inch square baking dish, or a large deep-dish pie plate. Cook the spaghetti in boiling salted water following the package instructions; drain thoroughly and set aside. In a medium bowl, whisk the eggs with the Parmesan cheese. Add the cooked, drained spaghetti and toss to blend. Transfer the spaghetti mixture to the prepared baking dish. Press it over the bottom and up sides of pan to form a "crust." In a large skillet over medium heat, brown ground beef with onion and mushrooms; drain well. Stir the spaghetti sauce and corn into the beef mixture. Spoon the beef and sauce mixture into the spaghetti "crust." Top with bell pepper rings or strips and then sprinkle with mozzarella cheese. Bake in the preheated oven for 25 minutes, or until the filling is hot and bubbly, and the cheese has melted and browned lightly.